SUFFERN, NY -Rockland Community College is embarking on a major campus-wide energy efficiency project that will reduce its energy bills (saving $558,000/year), in addition to the benefits of eliminating approximately 1,000 metric tons of GHG (greenhouse gas) emissions annually into the environment. Rather than continuing to make ad hoc adjustments to old and inefficient equipment, RCC has contracted on an $11.1 million retrofit project with Ecosystem, an award-winning Integrated Energy Performance Contracting company that guarantees the projected energy cost savings gained by their implementation of efficiencies to campus-wide systems. The college is in discussion with the State University of New York (SUNY) to fund a portion of the investment. The remaining investment will be financed through a tax-exempt municipal lease, a funding mechanism well established for energy performance projects, and incentives, most notably, a $1.1 million incentive from Orange & Rockland Utilities Commercial & Industrial Program. 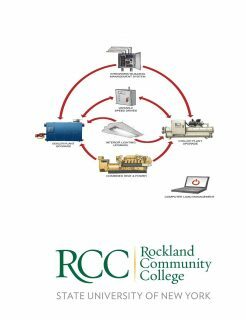 “Rockland Community College, with its commitment to reducing our carbon footprint, is very excited about the energy reduction project we plan to embark upon with Ecosystem. The project plays a major role in helping us fulfill our Sustainability Mission statement, in which we pledge to sharply reduce our global warming emissions,” said Dr. Cliff L. Wood, President of RCC. This project follows the long tradition to moving green at RCC, with each step bringing the College closer towards sustainability and carbon neutrality. President Wood recently signed the Second Nature Climate Commitment (to mark Earth Day, 2016), re-affirming RCC’s commitment to sustainability. Dr. Wood signed the American College and University Presidents’ Climate Commitment in 2007, soon followed by the adoption of a Sustainability Mission Statement outlining the College’s position on global warming, resource consumption and carbon emissions.RCC’s Technology Center, constructed in 2006, was awarded Silver Certification as a LEED (Leadership in Energy and Environmental Design) Green Building by the U.S. Green Building Council, and was the first green building constructed by Rockland County. RCC’s recycling program was launched 25 years ago and has gone on to win industry recognition. ENERGY STAR copiers/printers and recycled paper are amongst the features the program has employed. From 2000 to 2015, the college recycled almost 1,038 tons of material, saving $77,000 in disposal costs, earning rebates of around $17,000, and saving approximately 15,000 trees and 3500 cubic yards of landfill space. Recycling of paper, glass, metal, and plastics equals 75.11 tons, with a diversion rate of 33% (diverted from landfills). Other recycling includes: 400 lbs of batteries, 500 printer cartridges and a whopping 2.23 tons of textiles. Student Initiatives include a new Sustainability Club, an Organic Gardening Club, and an environmental club (Mug Action) whose leadership drove the reduction of disposable plastics on the campus through Hydration Stations for refillable bottles and elimination of Styrofoam from the campus cafeteria. RCC offers environmental educational opportunities, including an Associate of Science (AS) in Environmental Science and Associate of Applied Science (AAS) in Green Building Maintenance and Management. Continuing Education offers many environmental courses and through the Clean Energy Technology Training Initiative, offers classes such as Solar Hot Water System Design. On Earth Day, RCC invites the community, including local middle and high school students, to a day of interactive educational programs. RCC was awarded the Green Council Award by the Rockland Business Association in 2011 and the Transportation Innovation Award in 2016, and is a charter member of the Environmental Consortium of Hudson Valley Colleges and Universities and a member of Clean Air New York, a NYS initiative in support of downstate air-quality efforts.